The idea of a brain-computer interface (BCI) has been the stuff of science fiction since the invention of the computer. There are the obvious applications and situations where a direct connection between a user and a computer is advantageous. Having thoughts translated into action is appealing for a lot of reasons: speed, stealth, being hands-free/remote-control. A company called NeuroSky came onto the market with low-cost technologies which enabled EEG signals to be extracted from the surface of a person’s head, a very technically challenging signal filtering task. In the past, researchers had to shave a subject’s head and attach sensors to the bare skin with gel in order to get a decent signal. NeuroSky’s approach did away with all of that. Being the first BCI technology low-cost enough for the consumer market, NeuroSky generated a lot of buzz. Mattel and other toy companies even created toys based on the NeuroSky technology. That was in 2009. We are not sure why, but the buzz dissipated and things quieted down. Earlier this year NeuroSky announced a product called the MindWave and things are starting to heat up again. We thought maybe it was time we took a look. Do not let the consumer-oriented packaging fool you into thinking that this is just some gimmicky gadget. 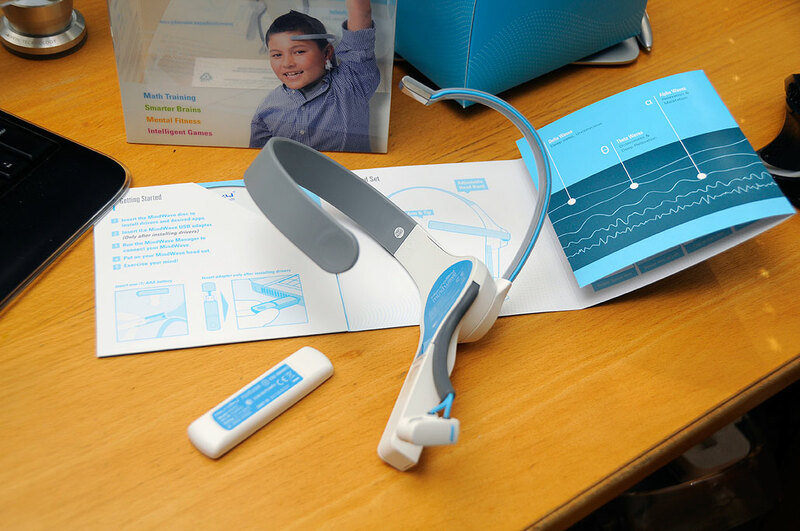 The NeuroSky headset is a real EEG detector capable of isolating brain waves from other signals. What makes the MindWave even more compelling for us is thast NeuroSky has provided a suite of developer tools completely free-of-charge for anyone interested in building apps for the device. Granted, this is a single channel detector, but a decade ago, neuro-researchers had to spend $100K for something with lesser capabilities. 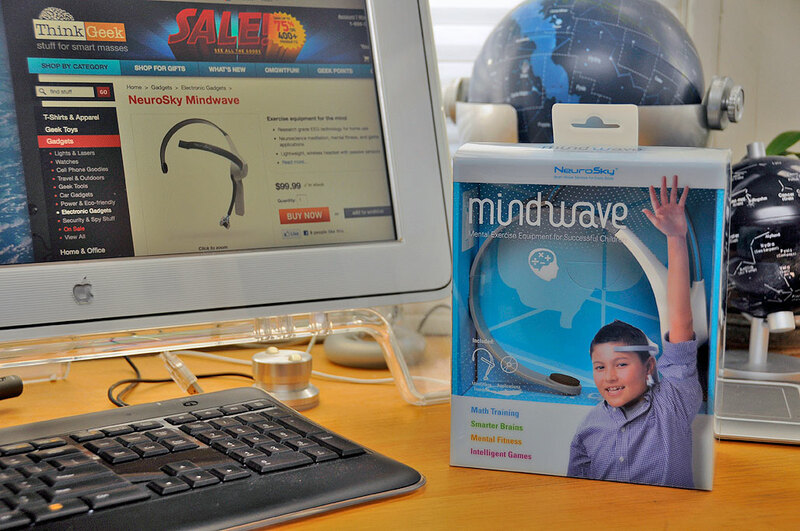 The NeuroSky MindWave consists of a headset and an RF receiver. The headset has a sensor at the end of a flexible arm, an adjustable headband, a grounding clip, and a small rectangular compartment for the electronics. The headset may be sized to fit by moving the headband and the sensor arm. Even with the AAA battery installed, the MindWave weighs less than four ounces. Data is transmitted wirelessly from the headset to the receiver. The receiver plugs into any free USB port on the computer. We have played with the headset and software a little bit and we have to say, seeing one’s brainwave fluctuate on screen is very cool. Trying to control one’s brainwave is frustrating yet oddly addictive. Being able to use it to make the software do somethingis just magical. However, there is still quite a gap between what we want the technology to do and what the technology can do. 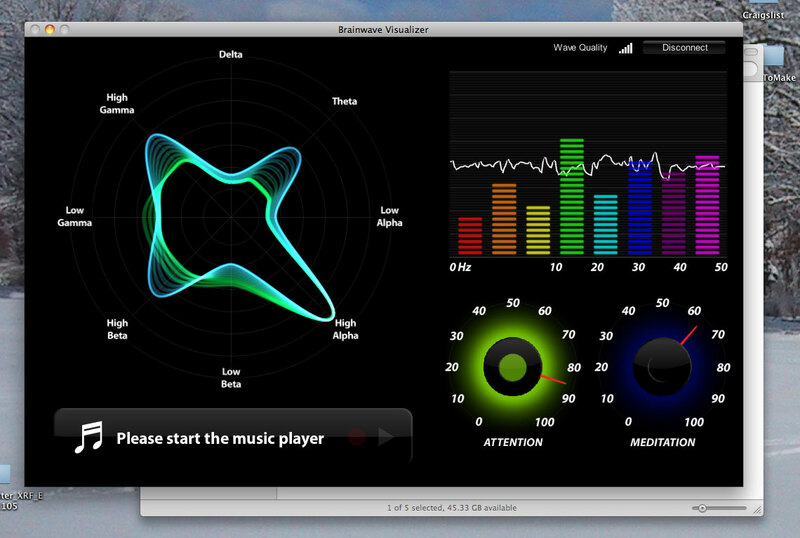 We’ll have a FirstUse review of the MindWave before the end of the month. If you can’t wait, then go get one from ThinkGeek. They are our go-to source for all things geeky. Awesome service and fast shipping…what more can you ask for?